An integrated binding system and versatile design make these skis a powerful tool for aggressive all-mountain skiers.. Monocoque double-wall construction combines fiberglass reinforcement layers and a fiberglass monococue for edge grip and acceleration during the turn. Prolink Twin Y + V arms in both tip and tail ensure fluent contact with the snow and responsiveness to forces applied on the ski during a turn. Poplar/beech wood core delivers high power and good ski reponse. Pilot system includes S912 Ti bindings, which use a double axis to allow skis to flex naturally; bindings are only compatible with Pilot system skis. Bindings feature lightweight titanium construction and Poweraxe Energy 2 Interface for precision grip and acceleration. Simultaneous wing adjustment. Removable brakes are easy to dismount for ski maintenance. I bought these previously "demoed" skis from an on-mountain rental shop after trying them for a couple of days. They are actually last season's model (03-04). But that's OK, because I had gone to the slopes -- after a seven-year hiatus -- with my circa 1992 205 cm Rossignol 7Gs. I would have skied happily on them, except that the toe and heel plates on my same-vintage Nordia boots disintegrated and the rental shop wouldn't fit their boots to my skis with their equally same-vintage Look bindings. So that's how I wound up on "shaped" skis. It's true that they really do like to go fast. I had a blast on them in mostly spring conditions with icy conditions in the morning and late afternoon. Not having skied in seven years, I stuck to the blue runs. The skis were very responsive in the bumps that I found on those runs. So I bought 'em. The shop knocked $100 off the $300 asking price for the skis and bindings. I look forward to skiing on them more next season, after I find some new size-14 boots! These skis really come into their own at high speeds and on steep slopes, where they really like to carve and hold an edge well. They afford a sense of security on the steeps. The list price ($1,000) is steep, but these skis can be purchased from www.sportsliquidator.com for $599 (or less if you use their eBay auction). If you buy these over the Internet, the bindings can be mounted with seven simple screws: four for the front binding and three for the rear--the skis come with mounting plates attached, and no drilling is necessary. This is a review of the 2003-04 Salomon Scream 10 Pilot Hot 175 cm (not Extra Hot). This ski was evaluated March 15-16, 2004 at Wolf Creek Pass ski area, Colorado. The snow conditions varied from ice to slush to packed, dry powder on this trip. At low speeds and shallow slopes I didn't notice much difference between this ski and my old 205's except they were shorter (and therefore easier to ski). At higher speeds and on steep slopes the skis came into their own and started to carve really well. Under these conditions the skis really like to carve and hold an edge well. They were stable in powder (6" deep) and gave a sense of security on really steep (30 degree) slopes. I had to force really short turns, but these skis are not meant to be slalom skis. They did well in moguls, using either carving technique or pivot-and-slip. Really tight turns are not a problem, but require more input than a pure slalom ski. The off-piste conditions during this trip were truly awful (frozen crud) but the skis seemed to match my intermediate frozen crud skills (are there expert frozen crud skills?) and I managed to stay mainly on my feet. My overall impression is that these skis are ideal for high-speed cruising and the steeps and give a sense of security and control on truly steep (more than 30 degree) slopes. If you want speciaty skis, say for powder or slalom, then of course they would be better at their specialty than this all-around mountain ski. But for general purpose skiing, especially at Wolf Creek where all runs are covered with powder much of the time, these skis work well. I also noticed that I wasn't tired at the end of the day, whereas with my old 205's, my quadriceps would really ache. I called a number of knowledgable shops while shopping for skis: Alpine Sports in Santa Fe prefers these skis above all others, and Taos Ski & Boot Company seems to rank them at the top along with the Volkl AX3. Unfortunately, I didn't have a chance to demo the Salomons before purchase, but in retrospect it was a good decision and it's hard to go wrong with such a highly-rated ski, although personal preference might lead another person to purchase a different ski. Very stable, pointable ski. Just dig in and carve it up. BIG mountain ability. Solid performer. Very nice ski. Better be for how much they retail for. Seems to be able to rip through everything, but def a advance ski. Dont turn when going slow - they need speed. Effortless turning, just roll the knees, i love the quick short turns, and they do it without effort. Stable at speed, and very pointable. A bit cumbersome in the trees, at 186cm, but its prob just me being a wimp. it is good on groomed, ice, and crud. This is only true if you like to do fast long arcs, or medium radius. It floats nicely in snow below a depth of 1 ft.
Tree skiing becomes a little more difficult, and mogals are a challage with these skis. these ski do not float very well in deep snow(ie over 1 ft) . short radius turns have to be forced with these skis. 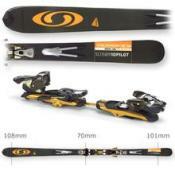 This ski is definitly an all mountain ski, and the pilot system is incredible. I am able to go through any snow condition, but it has some definite strengths and weaknesses. Im a CSIA lvl 3 instructor, which gets a lot of time to test skis, but i am a loyal salomon skier(im not sponsored). A Ski for fat guy's?? Give me a break! My last ski's, Kastle B-52's , 197cm. Would not work in powder, or any thing remotely close. So I bought a pair of Scream 10, 186's to head to Big Sky, and what a blast! They want to go like a young quater horse. We had, over a four day period, Ice, soft spring like snow, groomed soft, and off-piste crud with 4-5 inches of new. These ski's did incredible in all cases, and most reviews who say they turn themselves, are quite correct. This is not a whimp ski, you need to appreciate the quickness of the turns. OK, I agree, not the best bump ski, it does not like to ride flat, wanders a bit if not in a turn, but this is the type of sking I like. Varied terrain, steep, and off-piste, you can't go wrong with it. I just wish I had the opportunity to get into deeper snow with. When I hit the steeps, it was hard ice, ungroomed, with about 4 inches of new on top, and this ski saved my life, and made me look 25 years younger, just not stoned! At the price I paid, what a deal, I love it! This was the first pair of new generation skis I owned. Once I got accustomed to the short length and adapted my technique, they were a pleasure to ski. Just tip them sideways, apply pressure and they'll. Not ideal for deep powder, or steep moguls, but perfect if you can only afford one pair of skis that allows you to deal with all types of conditions. I bought the Scream 10 Pilot on sale a week ago - just in time for a 3 day trip to Whistler-Blackcomb. Funny how that happens. I especially enjoy edge-to-edge quickness and blasting down cruiser runs. I was leery of the All Mountain category - a generalist product often can't do anything very well. I gave my shiny, new Scream’s a good test, averaging nearly 20,000 ft vertical per day on variable terrain and conditions. They were as quick as I was, were stable at high speed on hardpack (without being on an edge), handled the bumps and did everything I asked of them. They did well on ice and in the junk (unfortunately no powder for that test). I agree with other reviewers - the Scream 10 likes to run! I must have set two PRs on favorite runs. A few times when I was tired or inattentive, I caught an edge and had to bring it back - it requires aggressive control. I may not sound objective here, but I honestly cannot find fault with the ski. I didn’t notice anything special or unusual about the Pilot integrated binding. It was there and it all worked very well for me. I weigh 210 and am glad I bought the 186 length. A sweet ski, I will have fun with these good looking boards for many years. These skis are pretty good in powder with fairly nice float. They are a little light for crud and tend to get pushed around. On the groomers, they handle short and medium turns very well - nice and quick from edge to edge. Not as stable as I would like at high speeds. I really couldn't tell the difference with the pilot system. Great boards. Tried these at a demo-fest in Dec. 2000 when they first came out and was amazed. Pilot binding system allows for even flex (really, no hype). Bought a 2001-2 pair well discounted and like them better, they have stiffened them a bit each year. Stable at high speeds. Size 186cm. True test is when emergency manuevers are necessary. Think and they go. Light enough so if you catch an edge, recovery is a snap. Not wide enough for deepest powder but work great in most conditions.